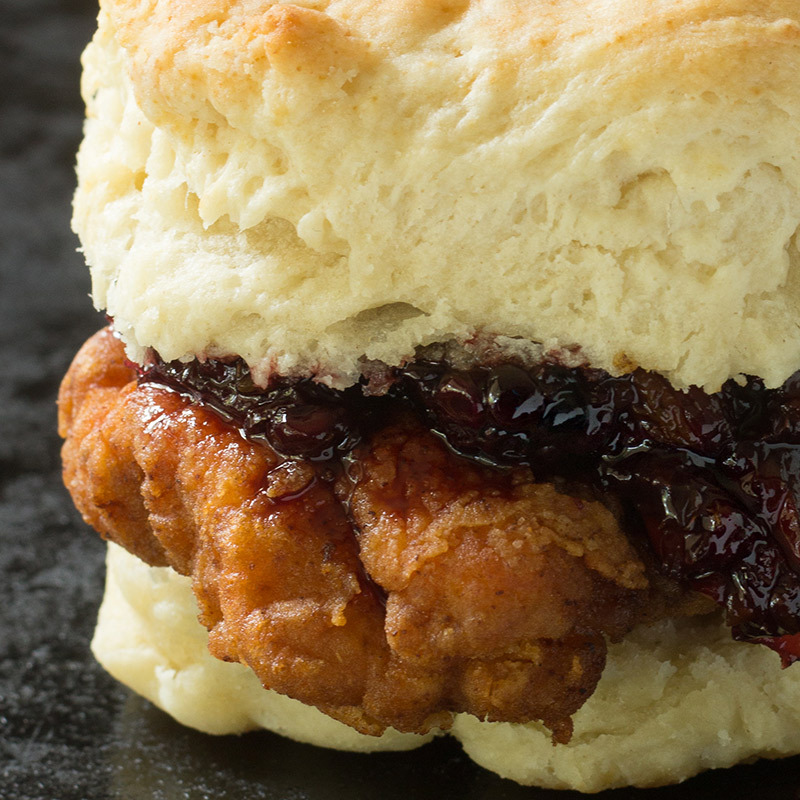 Hello my beautiful buttermilk chicken biscuit with blackberry habanero sauce! Let’s start this off strong- I love you! So I love my Grandma’s Flaky Buttermilk Biscuits. And I love crispy chicken tenders. And when you put the two together and top it with a spicy blackberry habanero sauce- it becomes a whole new thing. Ever so often I CRAVE biscuits. I know — you too right? My grandma always said you can’t trust someone who doesn’t like biscuits, bread and babies. Now that I think about it my grandma is a carb-o-colic. I love her, bless her heart. 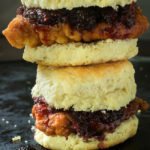 So I thought that nothing is more fun than a Buttermilk Chicken Biscuit with Blackberry Habanero Sauce. I mean, that right there = PERFECTION!!! I usually top then with honey butter for breakfast or for dinner. Heck let’s be for real I wake up thinking if it is a god idea to make a tray of biscuits. Then because I literally have no self control I make them but then I justify it by coming up with new recipes. So I decided to invite a few friends over for a chicken and biscuit love fest. So when I started to think up this sauce… all I wanted was something that was spicy. So it started because I had some super sweet blackberries in the fridge. And my mom picked some habanero from her tree. And I live in Florida so we have TONS of oranges. I put them in a pot and added a lil sugar, a lil balsamic vinegar, a lil thyme and what happened next was mind blowing! 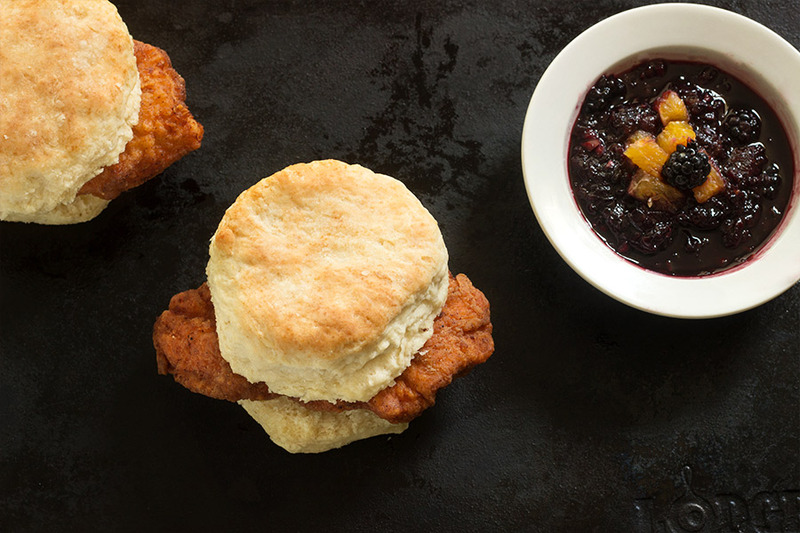 Now not only am I dreaming of biscuits but now I’m dreaming of blackberry hot sauce too. 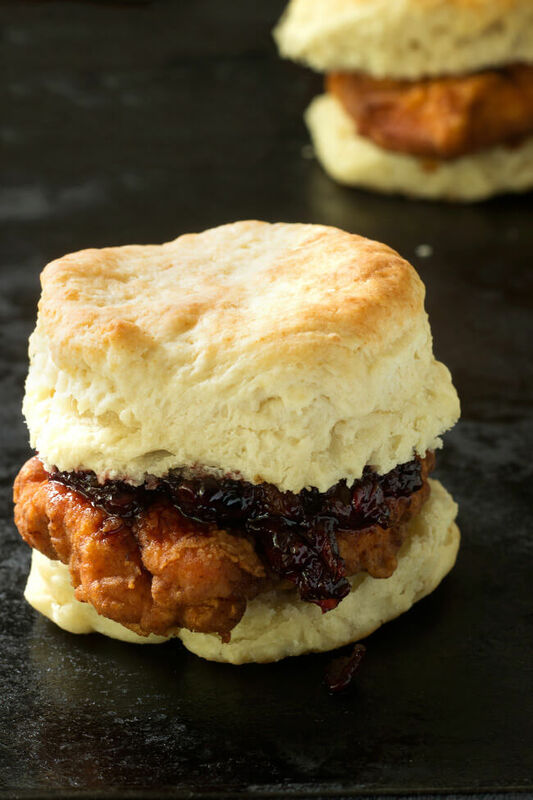 These chicken biscuits sandwiches are kind of one of those breakfast, lunch or dinner meals. I made these for dinner but I am having them for breakfast… right now! Yup, I can hardly contain myself. All I can say is the sauce… the sauce… the sauce! So my girls had them topped with honey butter. Isn’ it pretty? Then it was time for the grown ups to eat. We had it topped with Blackberry hot sauce! YASSSSSS!!!! I love when the lines between breakfast lunch and dinner gets blurred and what I end up with is greatness. Nothing super fancy, but does it really need to be? NO! make it fun- make it delicious- make it tonight! Add the ingredients for the hot sauce to a blender or food processor and blend until semi- smooth. Add the sauce to a sauce pan and bring to boil. Reduce to a simmer and simmer 15 minutes or until thickened slightly. Check every 5 minutes to make sure the balsamic vinegar doesn't burn. Allow to cool completely. Store in a jar for a week in the fridge. Preheat oven to 425. Sift flour, baking powder, sugar and salt into a large mixing bowl. Transfer to a food processor. Cut butter into cubes and add to flour, then pulse 6 or 7 times until the mixture resembles rough crumbs. (Alternatively, cut butter into flour in the mixing bowl using a grater, fork or a pastry cutter.) Return dough to bowl, add buttermilk and stir with a fork until it forms a rough ball (don’t worry if it is a little sticky). Gently roll out the dough some more, so that it forms a rectangle. Cut dough into biscuits using a floured glass or biscuit cutter. Do not twist cutter when cutting; this will crimps the edges of the biscuit causing it not to rise. If you have scraps just reform a rectangle and cut additional biscuits. Place biscuits on a baking sheet and bake until golden brown, approximately 10 to 15 minutes. Serves 6 to 8. Optional but recommended: Sprinkle chicken tender with Cheyenne pepper, chopped garlic and Paprika place in a ziplock bag. Store in the fridge overnight. If you can't marinate overnight, add the paprika, cheyenne pepper, garlic, and salt to chicken tenders. Heat oil to 350 degrees F. in a cast iron skillet, no more than 1/2 full with oil. Add the flour to a shallow bowl. In another bowl, beat the eggs and buttermilk together. Dip the seasoned chicken in the egg/buttermilk mixture, and then dip in the flour. Place the chicken in the preheated oil and fry the chicken in the oil until brown, crisp and cooked through, about 6-8 minutes. Drain on a paper towel. The recipe looks amazing! Just wondering what balsamic pepper is? Is it the same as balsamic vinegar? Can’t wait to try this out! Hiya Kayla!!!! It is balsamic vinegar… I mistyped that 🙂 But not I’m thinking about it I should totally make some balsamic pepper just for kicks lol!!! I’m so glad you like it Sherry!!! 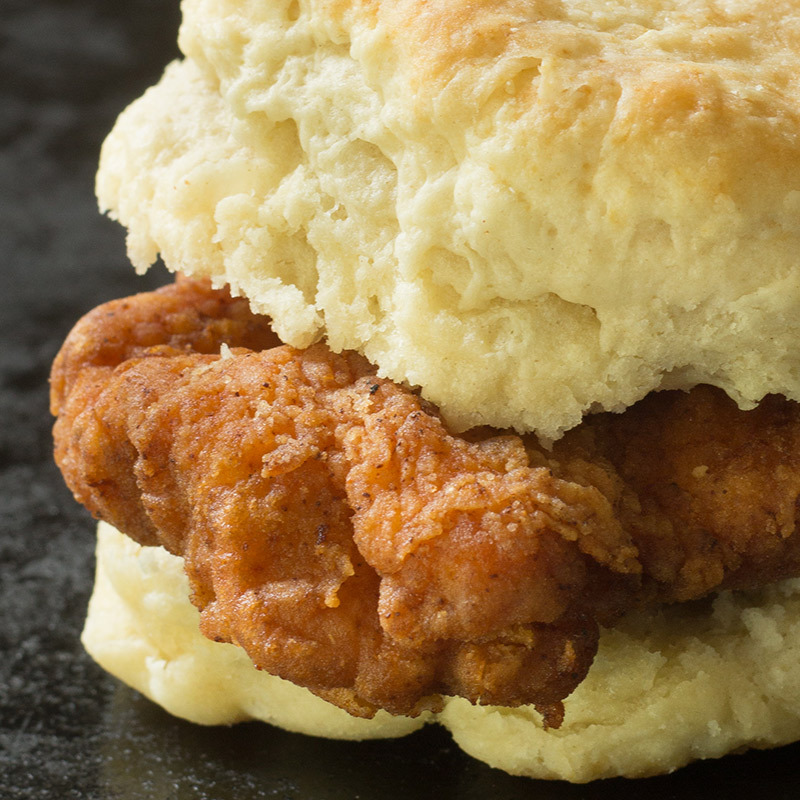 My goodness, I have never heard anything like this having a combination of chicken for biscuits. 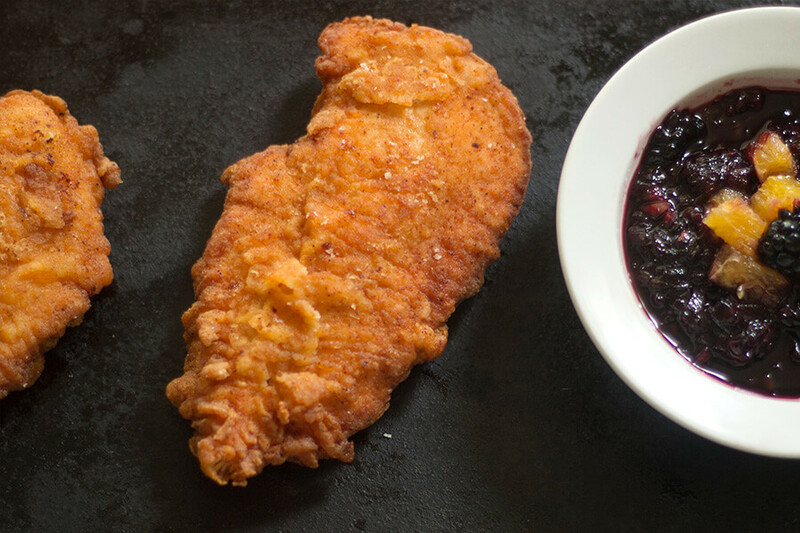 The recipe looks absolutely delicious & the blackberry sauce adds more yum to such a healthy food that anyone would fall in love. Those are perfect pictures, I find it difficult to believe that something so delicious like that can exist! Your grandmother’s hunch is right, never trust people that don’t like those food! This looks so delicious! I had to pin it! 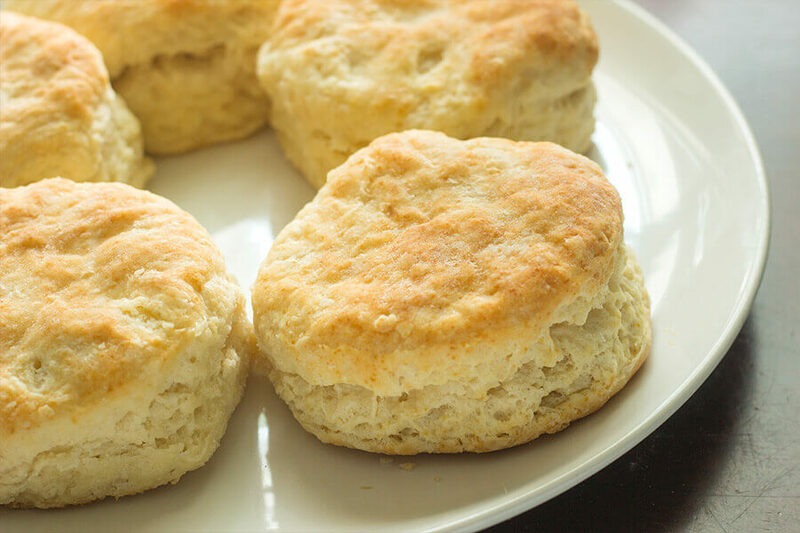 Sweet and spicy is one of my favorite flavor combos and you can’t go wrong with homemade biscuits! That looks really good. I would love to try this out. I have never had anything with that kind of sauce before. It sounds good. I’m so glad you like it Kathy! 🙂 Let me know how it turns out. Aside from the amazing chicken recipe, I am really curious about that blackberry habanero sauce! This is definitely a dish that’s packed with flavor and of course it’s a classic favorite with a twist. that looks to die for! i so need that right now. I’m glad you like it Enrioch!!! I found myself putting the leftovers my toast! Oh me oh my Rosey! I still haven’t recovered. lol! So good. What a great recipe! I like what you did and it looks delicious, I am going to try this and I am sure my family is going to love it. Thank you for sharing such awesome ideas. My son walked in and saw this and was begging me to make it. He loves anything that has peppers in it. Hahahahahaha! I’m so happy y’all liked it 🙂 Let me know how it turned out. Wow, this looks like a great recipe! And these pictures are great, there is so much texture in this! This sauce sounds amazing. I love fruit with some heat! Hiya Rachel!!! My kids love chicken biscuits too, topped with honey butter. OUT.OF.THIS.WORLD! That actually looks really good! My husband would love that! My family is a chicken and biscuit lover. The photos made my mouth water. I’m sure the Blackberry Habanero sauce made it tastier. I can’t wait to try your recipe. My kids love chicken tenders and biscuits much less when I put them together. They lose it! !